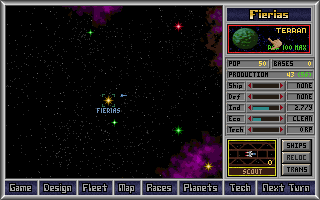 Todays space strategy games get way too compicated by resource managment and other annoying details. MOO has very easy resource managment which lets you concentrate on other strategies. Most games today have resource trees, in this game you can pour all your research into weapons or you can research multiple items at the same time, or steal tech from another race! The thing I really love about this game is how even if you fall behind in tech research you can still defeat your enemy by building a giant fleet made of small fighters loaded with cheap missles. You never feel like you need to start over if something goes wrong, you can always get over it. There are just so many options! The best turn based strategy game I have ever played, bar none. 9/30/2014 5:53:00 AM - GoOdy Your Losing Doing This FGE...Just Make It Free Again! 2/8/2013 9:04:00 AM - milkdaddy Moo2 is a good thing too. Its sad that people are trying to make $ off the greatest classic games of all time. 12/21/2012 6:36:00 AM - freethegame I really wish i could play this. 11/8/2012 8:58:00 AM - Leeroy hey, the paid games are still in My Games and are playable if you played them in the past. Unfortunately I don't have this one :-( Can anyone post a link ? 11/4/2012 9:06:00 PM - jxxx dear free games empire,this was one of my favorite games on this site and you ruined it by making people have to buy this.i don't care how rare this game is.MAKE IT FREE.i can play transport tycoon deluxe for free without even downloading it.if you could make this game free again it would make me very happy.p.s.this isn't my real account.i just forgot the username and password. 10/12/2012 12:45:00 PM - user i will visit no more FREE games empire !! and all the others site that should be FREE. I will dl a good emulator and dl games directly from other sources (i.e. torrent). i invite all user to make a HUGE EMBARGO on this site and all sites that should be free and it make you pay. 8/3/2012 7:56:00 PM - ira Ill never visit this site again. Thanks for all the time you provided moo for free. 8/2/2012 8:44:00 AM - , Still good that you're got the manual and page. 8/2/2012 8:39:00 AM - you "Bonus content included for FREE with purchase:" Why couldn't they have put MOO 1 in that bit. I've downloaded this on my little sis's compter, now to get it back. 8/1/2012 2:34:00 PM - Tony I still have the game in My Games menu. Thank god I made my registration. Direct links still works too. 8/1/2012 8:34:00 AM - FreeGameEmpire It's no reason to be rude. Once again: We do not charge the game we have no money from it, but since its being officially sold, we cannot provide it for free. The game is being sold by the official distributor and comes with a windows installer. I think that a link to the seller is better than delete this game completely from this site. Other abandonware sites also removed it from their collection. 7/31/2012 4:17:00 PM - Rick by the way your registration section has no enter button. in other words no one can join your site or anything. 7/31/2012 4:10:00 PM - Rick I can't find the FAQ section let alone the skill evidently to get it to run, I guess I'm a a failure. 7/31/2012 8:42:00 AM - ira its quite obvious that a lot of us would just like you guys to put it again for direct online play. Keep the empire FREE. ps i tried to do what you wrote but didnt make it. 7/31/2012 8:34:00 AM - FreeGameEmpire If You played the game online. Check the FAQ section, where you will find the location of game files on your hard drive. It will require some skill to run it on your own though. 7/31/2012 6:43:00 AM - Rick I'd like to say i'm really sad its no longer free to play since tried the download version and it will not work so I played the online version, as it goes if i'm going to pay for the game i'll just buy the CD version since it will work while the download version here does not. 7/31/2012 3:41:00 AM - ira why delete it completely? I played all the time.I believe others did as well. Its much more likely it will be abandoned now. Pls put it in a free mode again. 7/30/2012 4:02:00 PM - FreeGameEmpire Well, don't blame me. I thought link to the shop might be better than just delete it completely. If the game is being sold again it is no longer abandoned. 7/30/2012 3:26:00 PM - ira omg george u shouldnt do that after all its called FREE game empire. 7/30/2012 2:06:00 PM - ira did it just stop beeing free to play? why? 7/6/2012 9:49:00 AM - FreeGameEmpire Make sure, you have the latest ClickOnce plug-in installed. Firefox is known to have some problems with launching .net applets. If the latest plug-in still doesn't work for you, try older firefox distribution or another browser like IE or Chrome. 7/3/2012 12:36:00 PM - Madventurer For some reason, every time I try to play this with firefox it wants me to download emulator. Even though I have it. 6/5/2012 8:57:00 PM - Mark345 OK I have got it working. Can anyone remember how to turn off events? 5/6/2012 11:29:00 PM - Mark345 OK I have downloaded and tried to install but no joy. From D: it goes as far as trying to run but claims it needs expanded memory. From C: I can create the directories C:\MPS\ORION> but it won't recognise the command ORION or INSTALL. Just running the INSTALL program it asks for A: B: or *: I could make a floppy but what to put on it? DOSBox shuts down part of my keyboard so I can't use the \ key. Maybe someone could help but it has been many years since I have worked with DOS. 3/23/2012 5:48:00 AM - pschenk the game is great.. however my mouse quit work and only the keyboard responds.. has anyone else had this problem where the mouse no longer responds? 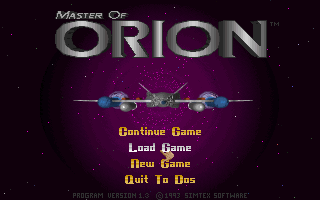 1/15/2012 1:24:00 AM - kenneth12 Playing this game makes me wonder why they made Master of Orion 3 so complicated it was unplayable. Glad I found this jewel. 1/13/2012 6:28:00 PM - Derp Looks like Sins of a Solar Empire and Galactic Civilizations took A LOT of inspiration from this. 12/1/2011 11:35:00 PM - johnny i got the game, i got dosbox. now what do i do?? 11/15/2011 5:51:00 AM - genghiskhan777 About Acecairo's review...Massing a fleet of only missle ships is not a good strategy. There are several techs that limit and even completely nulify the missles. Be Psylons and invest in tech, then run around in giant ships with beam weapons and deathrays. Much more fun. 10/18/2011 11:16:00 AM - Kay Its telling me to contact vendor.I'm guessing, this game is not working at the moment? 8/17/2011 1:19:00 AM - HELP i cant figure out how to play it downloaded emulator but now what? 8/8/2011 6:08:00 PM - BlueNine Wow, found the site yesterday and just spent about 10hrs solid playing this, finally learned to expand like crazy as soon as possible! 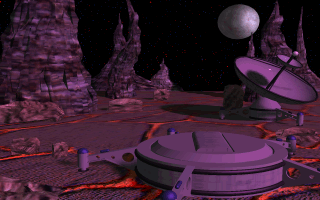 Can see where Galactic Civilizations gets a lot of its inspiration from and probably why it did so well. 7/1/2011 10:21:00 AM - Wytchfynder Aaaaaahh got this game from my uncle, and having bought a ten year old XP for the purpose of old games it worked fine. If it wasnt still in general sale it'd be cool to see the second one, 5/5 love the game. 4/8/2011 9:02:00 AM - FreeGameEmpire mcrazylaren: as for emulator problems please use our Technical Issues forum. 4/7/2011 11:47:00 PM - Mono yeah having issues with the emulator for all the games is it because I updated fire fox? Thats when it stopped working for me. 3/31/2011 4:10:00 AM - ScaScott Well, Mr. ???????? (I see you are too embarrassed to put in your name), had you looked down just a few posts (8 to be exact) you would have noticed that Daf actually mentioned it was great to find the game WITH the manual. This statement was not made just to take up space, you need the manual in order to answer the questions, you see back in the old days, they didn't have all these fancy schmancy encryptions types, they had a manual and used that for verification. Games would either ask you to identify ships/vehicles/units found in the manual, or ask you what the 5th word from chapter 3 in the second paragraph of the manual was, or in certain cases (F-15 authentication codes which had multiple versions ie, I had F-15 and my buddy had it as well for the Atari 8-bit, but the codes were different). In any case the manual is listed directly under the "play now!" button, perhaps you should play in windowed mode so you can swap back and forth and hopefully that will prevent you from complaining about a FREE game from a FREE website! 3/27/2011 4:53:00 AM - ???????? wtf, i lost because i couldn't identify the stupid space ships!! 3/21/2011 11:55:00 AM - Jarecki Now its OK. Thanks. 3/16/2011 2:30:00 PM - FreeGameEmpire Anyway I have discovered, there was incorrect performance setting for this game. I have corrected a configuration file. The game should have much better performance now. 3/16/2011 12:36:00 PM - jarek Hello, im wondering how to use dosbox default keys in emulator ? 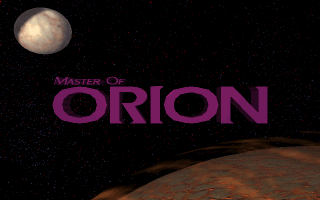 I want to play master of orion but game need a litle more CPU powr and i cant change it in emulator. Any advice? 3/15/2011 5:25:00 PM - Calmchaos Its been YEARS and this game still ROCKS!! 2/24/2011 9:55:00 AM - Daf I don't know how many times I've lost the manual and had to guess at the security questions. There are a few that I remember but dang it's been a long time. I love this game. Always have since the first day I saw it. Moo2 v 1.32 is fantastic as well but it just doesn't have the same flavor as 1. I am soooooo glad to find this site with the manual. Thanks Tons. 11/18/2010 4:43:00 PM - Damien Curtis I am in awe of this website It is a wonderful service. I second Jim croppers comment. As to the effectiveness of the adds on the site. I am going to the transiberian orchestra this November. 10/5/2010 3:28:00 PM - acecairo Greatest turn based strategy game I have ever played. 7/22/2010 5:53:00 PM - Jim Cropper I played this game for years and thought it was lost to me, thank you for this site.